I have not been very active in my kitchen towards the end of last year, as I was busy finishing other jobs, making and buying Christmas presents and arranging things for the baby. I have to admit: As I am used to cook every day – that’s what we recipe developers do, after all – it did feel nice to have a break and, as funny as that may sound to your ears, an empty fridge. I actually get stressed a lot about the amount of food I have in my fridge, as it makes spontaneous dinners out with my boyfriend or friends pretty needless – which is a shame, as I love those kind of dinners! With the beginning of the new year I am finishing off some final work, which requires kitchen activities, before the baby arrives next month. It does feel good to be back in my kitchen, making food which I know is good for me (as I know each and every single ingredient), however, I do admit, I am not at my fittest level any longer. Even standing up for 30 minutes is pretty exhausting with a 48-cm-tall baby inside of your belly! 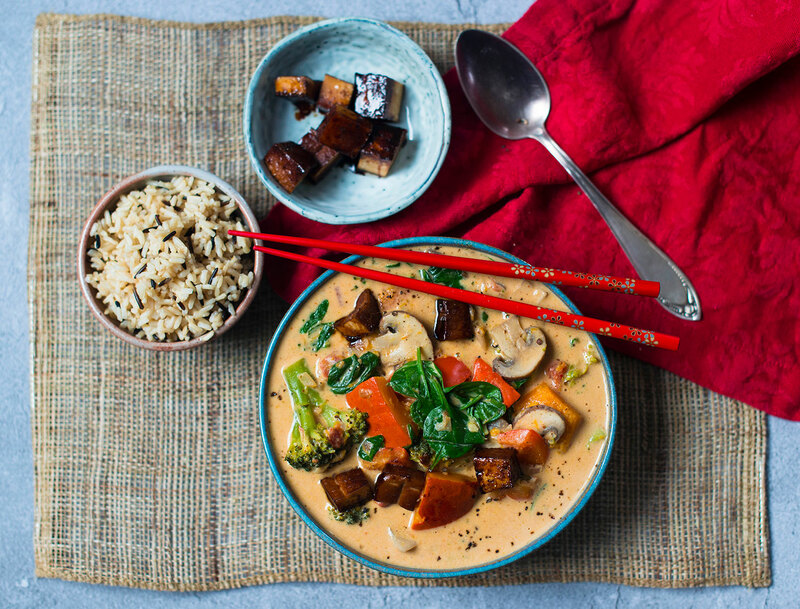 Yesterday’s recipe, which I created, was this vegan red Thai curry with peanut butter and roasted Hokkaido squash. I was inspired for it by a similar curry my boyfriend and I had in Berlin two weeks ago at a Vietnamese restaurant. It’s creamy, full of flavour and packed with crunchy vegetables. 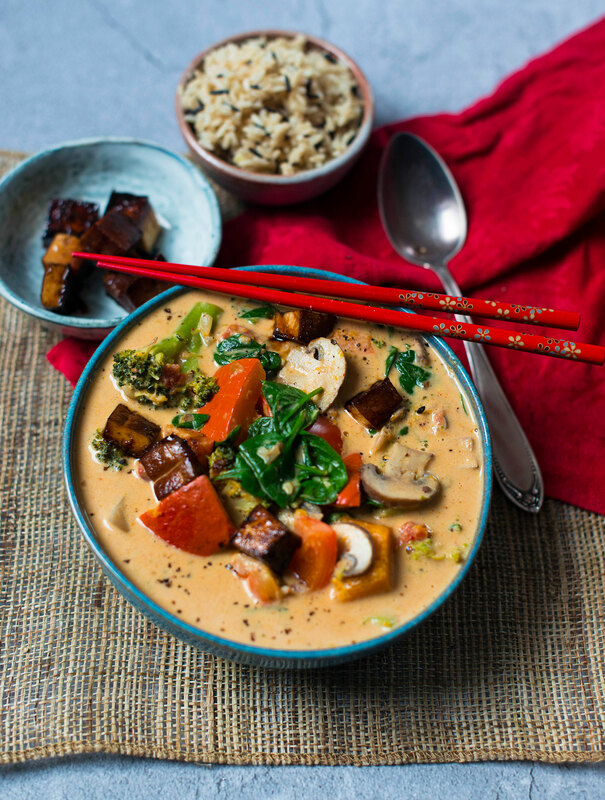 I served the curry with brown rice and some pan-fried smoked tofu – and am very happy about the fact that I do have some leftovers, which will turn into today’s dinner within a minute as soon as I have posted this recipe for you! 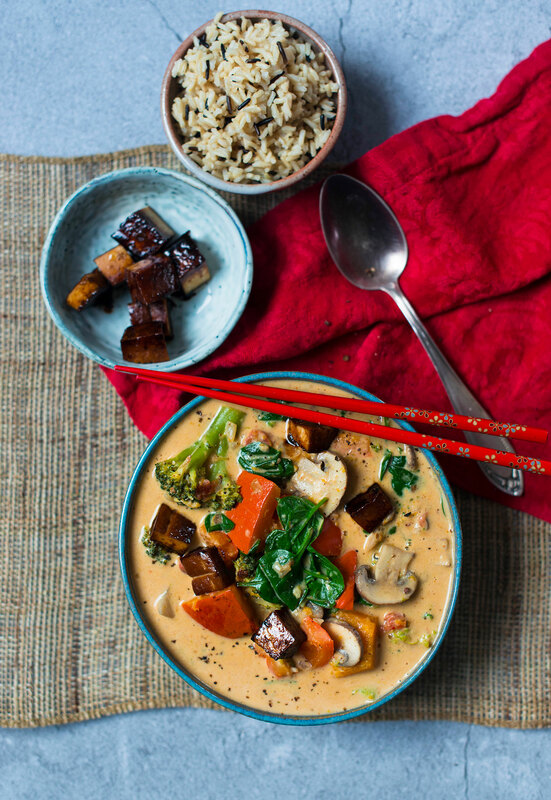 Enjoy this delicious, rich and creamy vegan curry! Preheat the oven to 200°C (upper and lower heat). Wash and deseed the Hokkaido squash, cut the flesh into bitesized cubes. Transfer squash to an oven-safe dish and roast in the oven for 20–25 minutes until done, turning the squash occasionally. In the meantime, prepare the remaining vegetables: Peel and finely chop garlic and onion. Divide the broccoli into its florets, peel and chop the stem, wash and drain the broccoli. Wash and deseed the pepper, cut it in cubes. Brush the mushrooms and finely slice them. In a medium-sized saucepan, heat the coconut oil, add garlic, onion and ground spices, sauté for a minute, stirring occasionally. Add the curry paste. Add broccoli and pepper, sauté for a minute, then add the vegetable stock. Cover the saucepan with a lid, allow the vegetables to cook in the stock for three to five minutes. 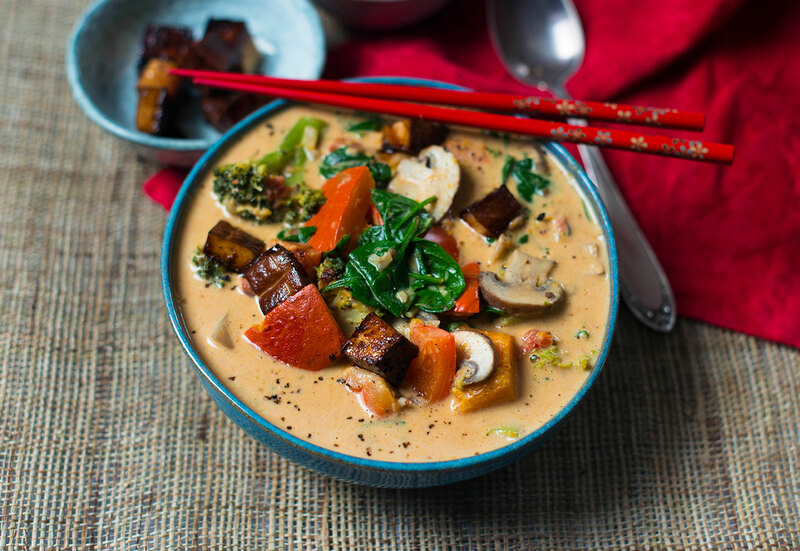 Add mushrooms and squash, as well as coconut milk, diced tomatoes and peanut butter. Stir well, bring the curry to a boil once again. Wash and spin-dry the spinach, add spinach to the curry. Remove the curry from the stove, season with salt and pepper to taste. Arrange curry in two bowls, serve with (brown) rice and fried (smoked) fried if desired.